Doodling is defined in Wikipedia as “drawing or scribbling aimlessly” … but doodling is so much more than that! Doodling has the capacity to improve memory, focus and cognition? 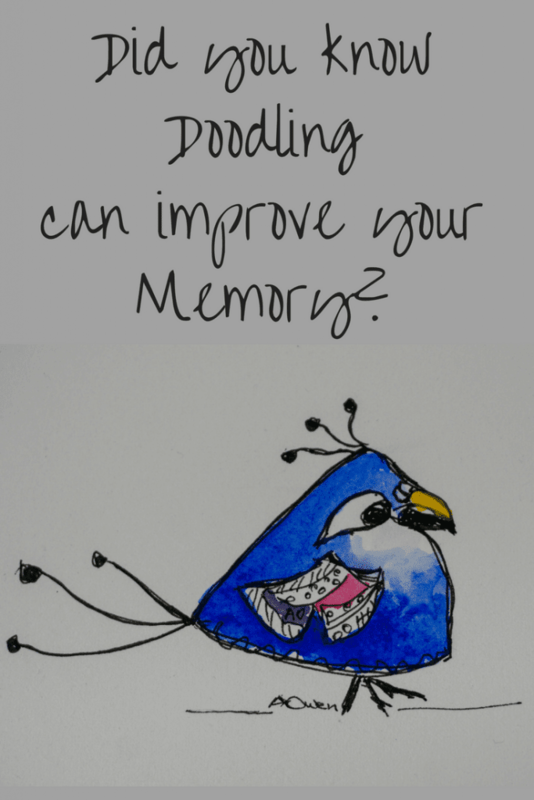 With the interest in memory loss as we all age, who would’ve thought that scribbling aimlessly would have such a positive impact. What exactly is a doodle? 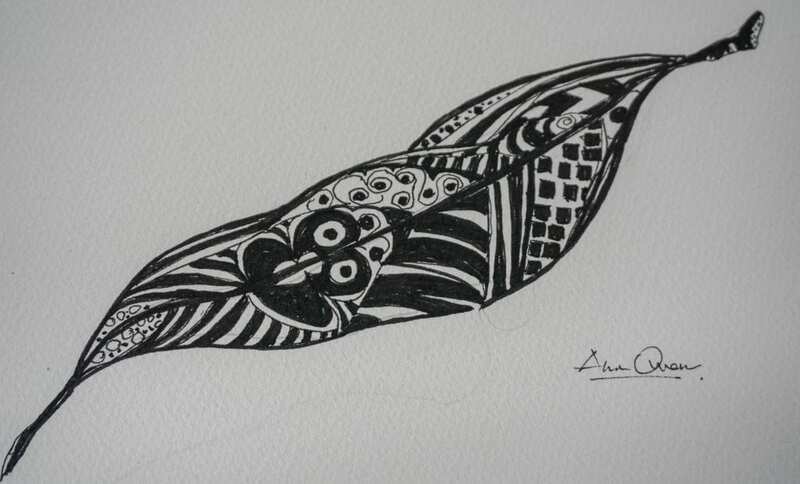 Doodling is a spontaneous act of drawing and a great way of expressing yourself. Simple and fun and once you begin it’s difficult to stop. The great thing is that your doodle can be as simple or as busy as you like. The fact is that most of us doodle without realising. It’s often thought of as art but doodling can help you develop drawing skills and make a great addition to your design portfolio. There are several types of doodling so try them all to see which you love most. Doodles are simple drawings which can be a mix of complex patterns, cartoon figures landscapes or a series of abstract shapes. Each and every one is different. Often drawn while a person’s attention is elsewhere. Doodles are often sketched in the corner or margin of a notebook but it’s not unusual for them to be stand-alone pieces of art. 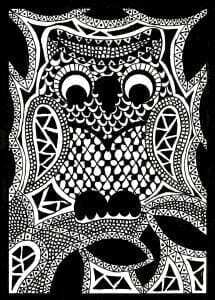 Zentangling is a technique which uses intricate patterns. It’s easy-to-learn, relaxing, and fun way to create beautiful images. The patterns are called tangles. Tangles are created by combining dots, lines, curves and orbs. The patterns are drawn on small pieces of paper called “tiles.” Once several tiles are created they can be assembled into mosaics to create a bigger art piece. StenDoodles are a method of creating an artwork that is a series of stencils and patterns. Use a stencil to create an outline and then add another stencil to create sections within that shape. Finally use smaller stencils to create patterns within each section. These can be coloured in, using brightly contrasting colours. Researchers have proven that doodling is beneficial to human development and not the frivolous waste of time it was once thought to be. New studies are showing exciting links to cognitive development through increased learning, creativity and performance. It is well known that stress is a major contributor to health issues, workplace challenges and work life balance. Getting in touch with your creative side is one of the solutions suggested as the key to deescalate the imbalance. Sunni Brown, an expert visual thinker and doodle expert says “It’s a calming activity that can help people go from an frazzled state to a more focused one”. Doodling is able to calm us, help us process information and act as a mechanism for creative problem solving and can change your physical and neurological state. While doodlers might appear to be wasting time to onlookers, this is rarely the case. Researchers have determined that doodlers are likely to be processing and analysing the information they are being given. According to a study published in the Journal of Applied Cognitive Psychology, doodlers find it easier to recall dull information than non-doodlers, because the latter are more likely to daydream. According to a study published in the scientific journal Applied Cognitive Psychology, doodling can aid a person’s memory by expending just enough energy to keep one from daydreaming, which demands a lot of the brain’s processing power. Acting as a mediator between the spectrum of thinking too much or thinking too little and helps focus on the current situation. A study done by Professor Jackie Andrade, of the School of Psychology at the University of Plymouth, reported that doodlers in her experiment recalled on average, 29% more than non-doodlers. According to Anna Almendrala from the Huffington Post, Jackie Andrade, a psychology professor at Plymouth University conducted a study of doodlers and found, “Doodling engages the brain’s ‘executive resources’ a processes that help us plan, multi-task and concentrate. People have the capacity to think artistically and develop ideas and understandings in all kinds of mediums. Million dollar ideas have been drafted out on a drink coaster or a napkin. Doodles are in the same league and often provide solutions along the way as people work through the processes. Poet and physician John Keats doodled in the margins of his medical notes. Mathematician Stanislaw Ulam developed the Ulam spiral for visualization of prime numbers while doodling during a boring presentation at a mathematics conference. Many American Presidents, including Thomas Jefferson, Ronald Reagan, and Bill Clinton, have been known to doodle during meetings but quite possibly the most famous doodler of all was Leonardo da Vinci. Doodling is one way all people, artistically inclined or not, can remain visual thinkers. Do you doodle? Are you a notebook doodler or do you make yours into a stand-alone piece of art? 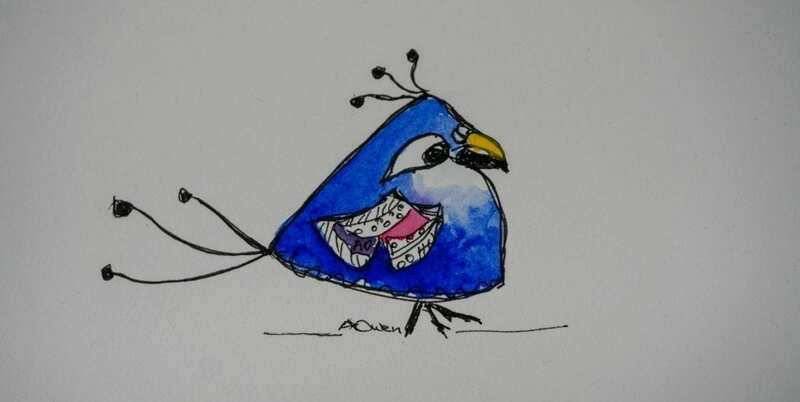 I admit to being a chronic doodler and have an assortment of doodles popping up in the most unexpected places! Where do you doodle?